Wash the Prawns well. (I used the frozen ones so I had to thaw for 15-20 mins by putting it under flowing water for 5 mins. and then keeping in a colander to strain for another 15 mins.). Add half the red chilli powder, a pinch of salt and a few drops of lemon juice to the prawns and mix well. Keep aside for 15 mins. Heat oil in a large non-stick pan (kadhai). Add the mustard seeds and curry leaves. Once the seeds start crackling add chopped garlic and ginger and saute for a minute. Then add chopped onions and cook till golden brown. Add the chopped tomato and mix. Add salt, red chilli powder, turmeric powder, garam masala, fish curry powder (if available) and black pepper powder and mix well. Cook till soft and onion and tomato combined. Add prawns and mix. Saute for 2-3 minutes. Add water and give a nice stir. After 2 minutes, add the almond powder and mix. 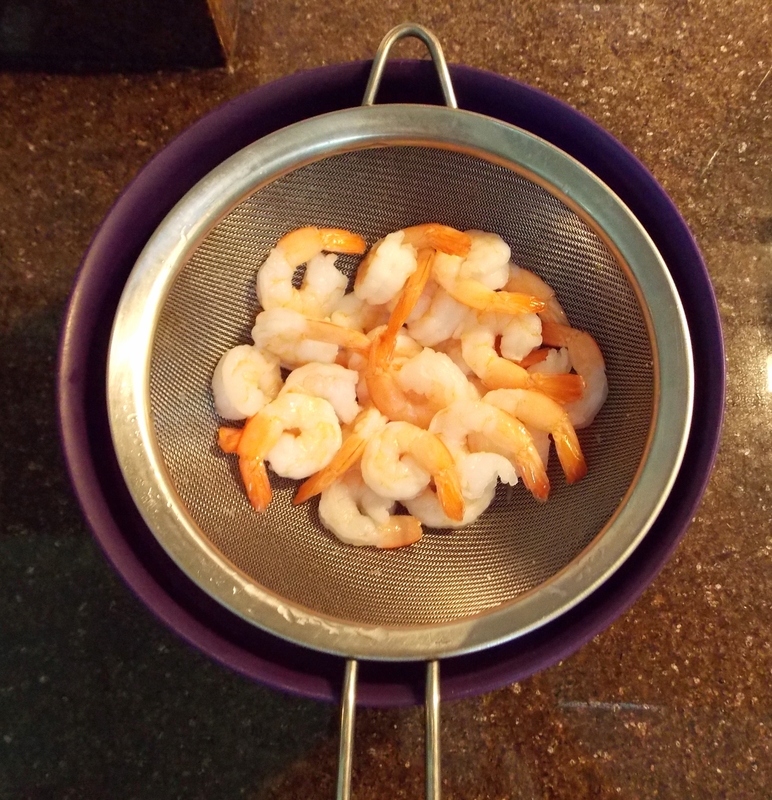 Cover with a lid and cook till prawns are soft (about 7-10 minutes). Keep checking and stirring at intervals. Once the prawns are cooked check if the curry is too thick then add half a cup of hot water and cook for a minute. Add the salted butter and mix. Finally, garnish with fresh coriander leaves and serve hot with steamed rice. Relish with your family and friends. it looks so good! Thanks for being at FF! This look and sounds so delicious and easy too! Thank you for sharing your recipe with us at Fiesta Friday. As co-host, please may I ask you to edit your post to include the link and a mention to Angie’s Fiesta Friday #61 post – this ensures that you can be considered for a feature next week. Thanks so much! Thanks so much! I am sure you and your son would love it. 🙂 Let me know when you try! Wow this looks so good! 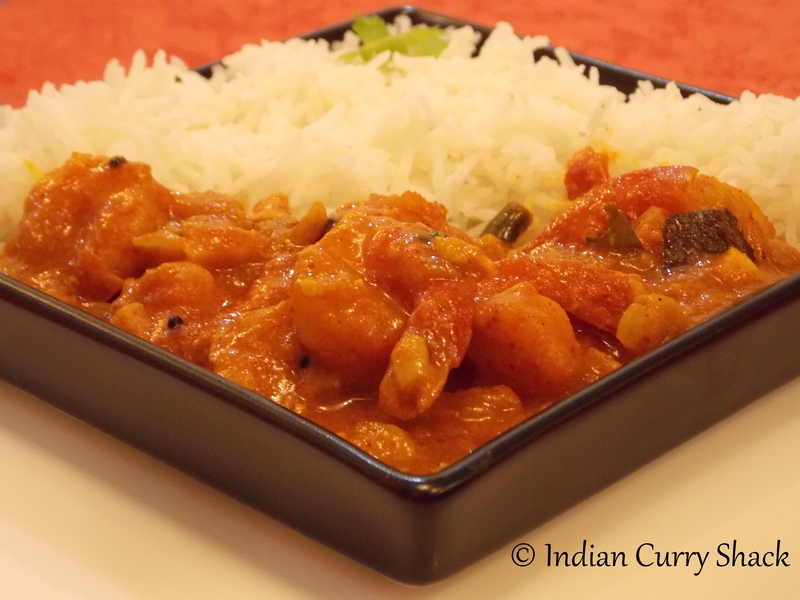 My husband loves seafood curries… I’ll have to make this for him sometime soon! Thanks a lot! 🙂 Do let me know how it turns out when you try.